The Paschal greeting is a custom among Orthodox Christians, consisting of a greeting and response. Instead of "hello" or its equivalent, one is to greet another person with "Christ is Risen!". The response is "Truly, He is risen!" (or "Indeed, He is risen!"). 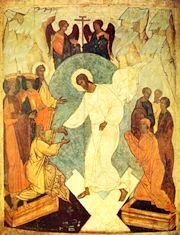 This greeting is used during liturgical services and informally at other times, starting with the feast of Pascha and lasting until Ascension – the period known as the Paschal season or Paschaltide. In practice, this greeting is typically used only with people that one already knows are Orthodox. In some cultures (for example in Russia), it was also customary to exchange a triple kiss after the greeting. Orthodox Christians often compile lists of the greeting in various languages, as it is used around the world, and these are sometimes recited in church or in other formal settings as an act of Orthodox unity across languages and cultures. Slovak – Kristus vstal z mŕtvych! Skutočne vstal (z mŕtvych)! English – "Christ is risen! Truly, He is risen!" or "Christ is risen! Indeed, He is risen!" or "Christ is risen! He is risen, indeed!" Iyaric Patwa – Krestos a uprisin! Seen, him a uprisin fe tru! German – Christus ist auferstanden! Er ist wahrhaftig auferstanden! Frisian – Kristus is opstien! Wis is er opstien! Yiddish – Der Meschiache undzer iz geshtanen! Avade er iz ufgeshtanen! Norwegian – Kristus er oppstanden! Han er sannelig oppstanden! Istro-Romanian dialect – Uscrâsnit–å Isus Crist! Zaista uscrâsnit–å! Macedo-Romanian (Aromanian) dialect – Hristolu anyie! De–alihea anyie! Megleno-Romanian dialect – Hristos anghii! Istana anghii! French – Le Christ est ressuscité! En verité il est ressuscité! or Le Christ est ressuscité! Vraiment il est ressuscité! Spanish – ¡Cristo ha resucitado! ¡En verdad ha resucitado! Portuguese – Cristo ressuscitou! Em verdade ressuscitou! Galician – Cristo resucitou! De verdade resucitou! Old Irish – Asréracht Críst! Asréracht Hé–som co dearb! Scottish Gaelic – Tha Crìosd air èiridh! Gu dearbh, tha e air èiridh! Sanskrit – Krista uttitaha! Satvam uttitaha! Aleut - Kristusaq Aglagikuk! Angangulakan Aglagikuk! Alutiq (Kodiak Aleut) – Kristusaq ungwektaq! Pichinuq ungwektaq! Yupik – Xris-tusaq Ung-uixtuq! Iluumun Ung-uixtuq! Tzotzil – Icha'kuxi Kajvaltik Kristo! Ta melel icha'kuxi! Tzeltal – Cha'kuxaj Kajwaltik Kristo! Ta melel cha'kuxaj! Filipino (Tagalog) – Si Kristo ay nabuhay! Totoo! Siya nga ay nabuhay! Indonesian – Kristus telah bangkit! Dia benar-benar telah bangkit! Igbo – Jésu Krísti Ébilíwõ! Ézia õ´ Bilíwõ! Lugandan – Kristo Azukkide! Kweli Azukkide! Swahili – Kristo Amefufukka! Kweli Amefufukka! Turkish – Hristós diril–Dí! Hakíkatén diril–Dí! Estonian – Kristus on üles tõusnud! Tõesti, Ta on üles tõusnud! Meadow Mari – Христос ылыж кынелын! Чынак ылыж кынелын! Basque – Cristo Berbistua! Benatan Berbistua! Paschal Polyglotta: The Paschal greeting in 250 languages. This page was last edited on April 18, 2018, at 19:19. This page has been accessed 238,506 times.